FoolFuuka is a PHP web viewer paired with the Asagi archiver (by Eksopl). It was developed by the FoolCode team who originally made this fork for archive.foolz.us. Currently, it is maintained by 4plebs and the Bibliotheca Anonoma. 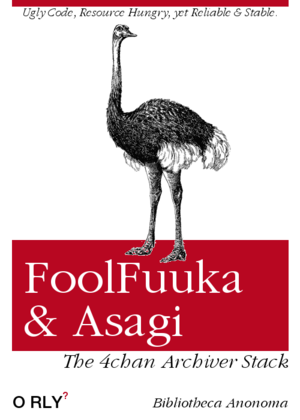 Since the main developers of Asagi (Eksopl) and FoolFuuka (FoolCode) have stepped away from anything more than maintenance development ever since they stopped operating 4chan Archivers, these two forks are the mainline development repositories for the FoolFuuka/Asagi stack in a multiorganizational collaboration between 4plebs and the Bibliotheca Anonoma. pleebe/FoolFuuka - The 4plebs fork of FoolFuuka is the mainline fork used by 4plebs, Desuarchive, RebeccaBlackTech, and many other archivers. bibanon/asagi - The bibanon fork of Asagi is the mainline fork used by Desuarchive, RebeccaBlackTech, and Archived.moe. desuarchive/foolfuuka-plugin-ban-logging - 4chan ban logging plugin for FoolFuuka. bibanon/eve - [4chan Scraper] (Stability testing) Desuarchive currently uses the Python-based Eve scraper in experiments to archive the troublesome board wsg, and eventually gif. pleebe/foolfuuka-plugin-fourchan-api [4chan API for FoolFuuka] - (In development) 4chan API Compatibility plugin for FoolFuuka. A modified fork of clover that could use the 4chan API could be used as a mobile frontend. We may also try to find something that can be deployed using Qt or ncurses. Installing on RHEL7/CentOS 7 - We prefer to use CentOS 7 with SELinux in the future. Installing on Windows, Apache, Mysql, PHP - Not recommended but it can work. FoolFuuka/Start - Start up Asagi, Sphinxsearch, and FoolFuuka. FoolFuuka/Import - Import data from the dumps. FoolFuuka/Housekeeping - You may be ordered by the provider, by the state, or by a plea from the person themselves to clean up data. Here's how. FoolFuuka/Troubleshooting - Restart the site if its down or troubleshoot if there are problems. FoolFuuka/Upgrading - Upgrade FoolFuuka to the latest version. FoolFuuka/Plugins - Plugins and extensions you could use. An advanced section for setting up the architecture needed to run FoolFuuka/Asagi/SphinxSearch at scale. FoolFuuka/MySQL - We use Percona MariaDB, a version of MySQL. It is also tokudb. FoolFuuka/Sphinx/Advanced - At Desuarchive the search server serves both Desuarchive and Rbt.asia, and is hosted on a server seperate from the frontend, database, and scraper with OpenVPN connecting the two. FoolFuuka/Asagi is notorious for their large and unwieldy database. We use this command to do daily and weekly dumps without getting locking problems. Don't just release the bare SQL dump into the wild. This script will dump to CSV, which is actually quite easy to import back. This page was last edited on 31 March 2019, at 18:54.